Let me start by saying that I’m not necessarily trying to make a case here. I’m simply opening up my skull and pouring out thoughts. It’s highly likely that in a short period of time, I very well may disagree with what I’m kicking around here. So, don’t hold me to anything just yet. Just hear me out and if you’d like to, post a comment. Also, there are way more things in my head about this to come. Stay tuned. I’m a full-time student ministry pastor. Some people reading that might not be able to believe such a thing exists. I receive full-time pay, including benefits, vacation time, sick days, etc. in exchange for loving, leading, and discipling middle school and high school students. Some might think that’s barely more than pizza parties and dodgeball with the occasional “spiritual high” thrown in once in a while to keep things looking legit. But let me assure you: it’s much, much more than that. I’ve been in full-time student ministry for nearly 17 years now. I began at the age of 21 and if you’ve done your math correctly, you know that I’m currently 27 years old. Or so I feel. Student Ministry is where I’m most useful to God, I believe. Student Ministry isn’t an easy gig, but its the most rewarding thing I can think of to be doing with my life. And I love it, love it, want s’more of it. But therein lies a reality I’ve discovered. I’m certainly not the first to discover it any more than Christopher Columbus discovered anything whatsoever. But let me share with you my thoughts on full-time ministry because I’m pretty sure if you’re someone in full-time ministry like I am, you’re pretty ticked at the title of this blog post and you’re wanting me to hurry up and “‘splain myself.” So here goes. Being a pastor means I’m all about people. But being a full-time pastor means most of my time is geared toward people who are already “Christians”. This is the necessity I’ve found as it relates to my responsibilities as a pastor. The bottom line is this: The lion’s share of my time is dedicated to keeping the ministry ball rolling, which by default keeps me out of the flow of culture, community, and evangelism. I’ve been given a title, a job, and a long list of responsibilities. None of them bad; all of them good, quite actually. However, when there is an absence of intentional leeway given to a full-time pastor, then what you have here is what I fear is the reality for far too many full-time pastors: the Jesus bubble. The Jesus bubble is that barrier that keeps me in here and the world out there. While I complete my tasks and accomplish stuff, I am simultaneously not in a position of rubbing elbows with non-Christians. Yes, I know about my neighbors, I know about the lady at the bank, I know about the other parents at my kids’ schools…and I love them all. But I don’t spend 6-8 hours every day with any of them. I kid you not; most of nearly every one of my days, I am surrounded entirely by people who love and follow Jesus. While you may read that and find aspects (or all) of it euphoric, I want to assure you that leaning too far in either direction leads to you falling over. You can either lean toward the Jesus bubble and enjoy your “Christian ghetto” as I’ve heard it referred to, or you can lean too far in the other direction and say, “Well, there shouldn’t be pastors at all because we need all the people we can out in the trenches, getting dirty, spreading the Word (as if what I do now doesn’t include any of those things). 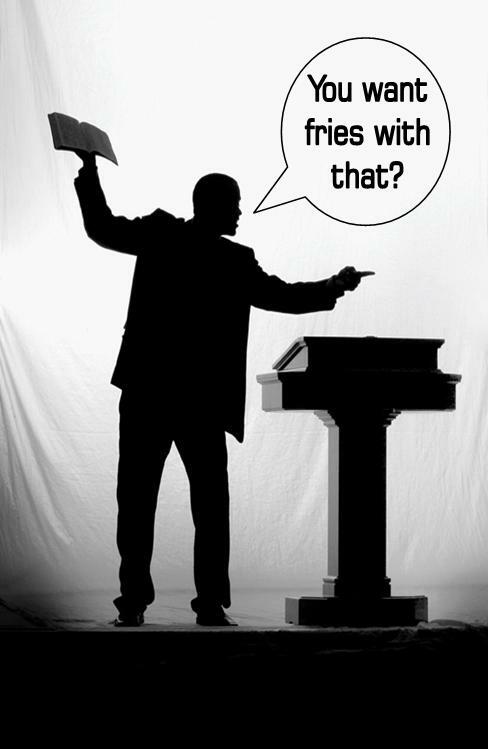 Are pastors bad ideas? What am I, crazy? I’ve read the Bible and pastors are God’s idea! Some people might think that pastors are “paid to love Jesus” and while I get that, I hate it. It’s not true at all. I’m not loving Jesus for money (how freakishly twisted would that be? ); I’ve simply been given the freedom to pastor students while knowing that my income is covered. That’s the best way I can explain it. I feel like I need to throw in a caveat; a disclaimer of sorts. I LOVE that God has allowed me the opportunity to be where I am and do what I’m doing. I’m not inviting my senior pastor to fire me. And I’m not resigning or even quitting. I just wonder what would happen to the ministry I lead if I were part-time here and part-time somewhere other than a place where little Jesus’s are literally around every corner. I need to stop here, but count on a Part 2 and in the meantime, whatever your situation, I’d love to hear your thoughts. Hi Jerry. I’m always so eager to read what “Jerry Thinks” and “Casey Thinks” you’re on to something. Maybe the church could offer you “community service hours” like we government employees receive. Another twist of words, to be sure, but this way a dedicated portion of your work hours could be spent outside the bubble. I don’t know what that might look like. Would you wander Wal-Mart? Recruit more kids for XZone? Or perhaps start a weekly ministry of those XZone students to provide yard work for the elderly? XZone kids aren’t all Christians, right? Perhaps working alongside them in an act of service would be one more way to pastor and grow the flock. I, too, would love to see what you could do in a corporate setting. The Jesus conversation is a tough one to broach, but the door does open and the conversation can be had. I’m living my faith more than talking about it right now. People do notice, and it’s often what gets the conversation started. Best to you in your continued thoughts, and I look forward to Part 2. We would LOVE for Jerry to recruit more kids for XZone and I think you are really on to something with the yard work thing too Casey! Don’t know if this applies, but I’m loving having “staff” for the first time! The Morton’s are super and they’re part time. They’d like to be full time, though. Maybe one day. Thanks, bud!